MANILA, Philippines - How do departed people bid their loved ones goodbye? We’ve heard several stories proving that death doesn’t cut the connection between loved ones. While many have seen apparitions of their dead family members or friends, other have claimed that their deceased loved ones have contacted them from beyond the grave. A grieving mom named Joy Ganda Vibar-Alamares apparently received one last hug from her son during his wake through a moving white balloon. The hair-raising moment was captured on video and was shared on her Facebook account on November 2, 2015. However, it was only recently that the video has gone viral with over 2 million views and more than 55,000 shares on the social network. 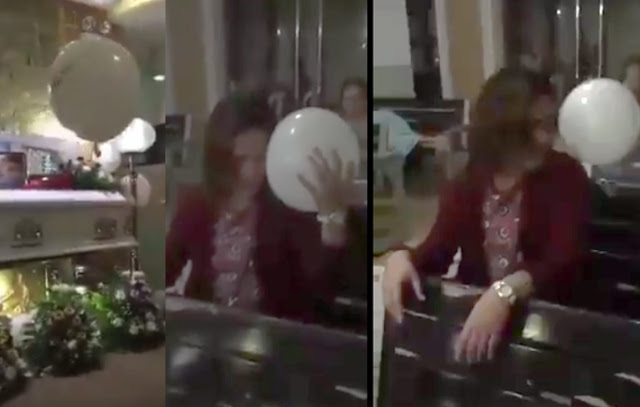 In the video, a white balloon mysteriously made its way towards the grieving mother. When the balloon finally reached Joy, it suddenly encircled her body as if it was trying to “hug and comfort” her. It appears that the spirit of Joy’s son was trying to bid her goodbye through the moving balloon. Although several netizens who have seen the viral video pointed out that the balloon moved sidewards due to lack of helium, many believe that the strange phenomenon was the departed boy’s way of giving his mom a final hug. Watch the eerie yet touching moment. In funerals, balloon releases are becoming a trend since the act serves as an expression of love for the deceased. This final act of tribute becomes a source of inspiration and comfort as well as a visible way of letting go of a departed loved one. Friends and family members usually say a prayer or write a personal message on the balloon before finally releasing it into the air.